Should Wisconsin Reconsider Medicaid Expansion? States that did saw the largest decrease in uninsured. 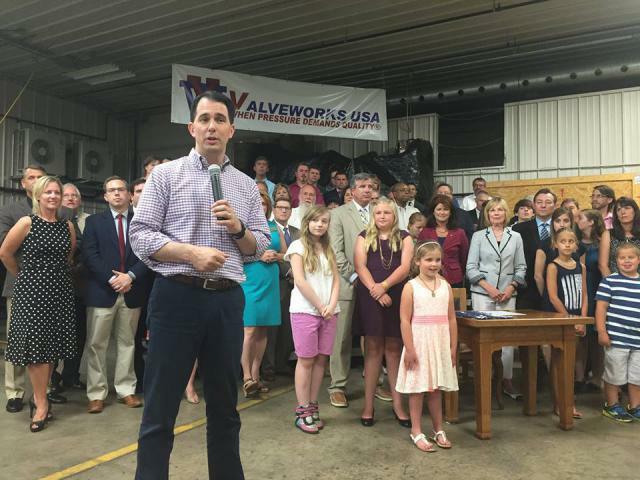 Governor Scott Walker signs the 2015-17 State Budget into law at Valveworks USA in Waukesha. Photo from the State of Wisconsin. The inability of Republicans to come up with a replacement for the Affordable Care Act suggests the ACA is here to stay. Is it time to revisit Wisconsin’s rejection of federal money to expand Medicaid? After seven years of arguing that they would “repeal and replace” the ACA, Republicans were unable to agree on a replacement plan, much less on a politically viable plan. The ACA has many provisions, including allowing young adults to stay on their parents’ insurance plans until age 26, eliminating out-of-pocket costs for many preventive services, closing the Medicaid prescription drug “doughnut hole,” mandating that large employers offer health insurance to their employees, and raising taxes on upper-income Americans to help pay for expanded coverage. However, most of the attention–and controversy–has swirled around two ACA provisions. The first gives states the option of expanding their existing Medicaid program to cover most adults under 138 percent of the official poverty rate with the federal government paying at least 90 percent of the additional cost. The second, and most controversial, are a series of provisions aimed at reforming the individual health insurance market. These include creating health insurance exchanges which provide financial help to low- and moderate-income Americans, setting minimum standards for policies, and prohibiting insurance companies from denying coverage because of a person’s medical history. The ACA was successful in driving down the uninsured rate. Nationwide, according to a continuing poll from Gallup, the uninsured rate fell to 10.9 percent in the fourth quarter of 2016, from 17.3 percent in 2013, the year before these two provisions took effect. Looking at the results for the individual states, a major factor in reducing the number of uninsured residents is whether or not the state expanded Medicaid, as the next graph shows, based on surveys from Gallup. (Data from the Commonwealth Fund’s analysis based on Census data tell much the same story.) States expanding Medicaid are shown in blue; those turning down the federal funds in red. The trend for each group is shown as dotted lines in the same colors. 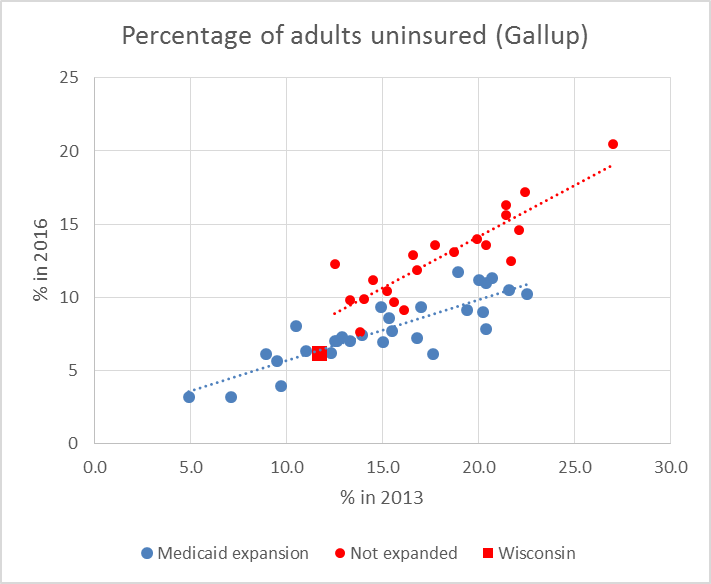 States accepting the Medicaid expansion saw greater drops in the number of uninsured. Although states initially expanding Medicaid were heavily skewed Democratic, a number of Republican governors have since pushed to expand Medicaid. Examples of expansion states with Republican governors are three in the Great Lakes region (Michigan, Indiana, and Ohio) and Wisconsin’s neighbor Iowa. Most recently, Kansas’ Republican-dominated legislature overwhelmingly voted to expand Medicaid, only to see it vetoed by the governor. As a group, the uninsured rate in states that accepted the federal dollars both started lower and went down more, as shown in the graph below. This further widened the gap between the two groups of states. It is likely that cause and effect acted in two directions. Expanding Medicaid offered insurance to more people. In addition, the decision to expand Medicaid likely reflected a political philosophy that government had a responsibility towards helping people who struggled to get insurance coverage. On average, the percentage of uninsured residents went down 48 percent in the expansion states, compared to a 29 percent decline in the non-expansion states. 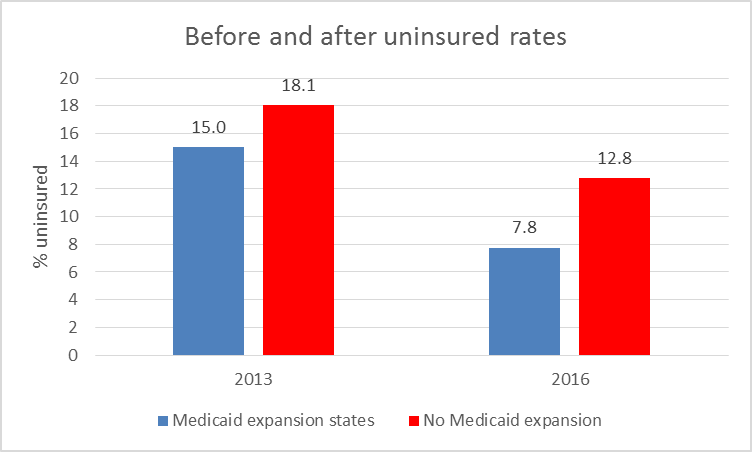 As a very rough calculation, this would suggest that 40 percent of the decline of uninsured people in the expansion state can be credited to the Medicaid expansion, leaving 60 percent due to the exchanges and other provisions of the ACA. I left out Wisconsin from the previous calculations because it took a unique approach. Rather than take the federal money to expand Medicaid, it pushed out those Medicaid recipients who made more than the federal poverty level making room for people making less than that. 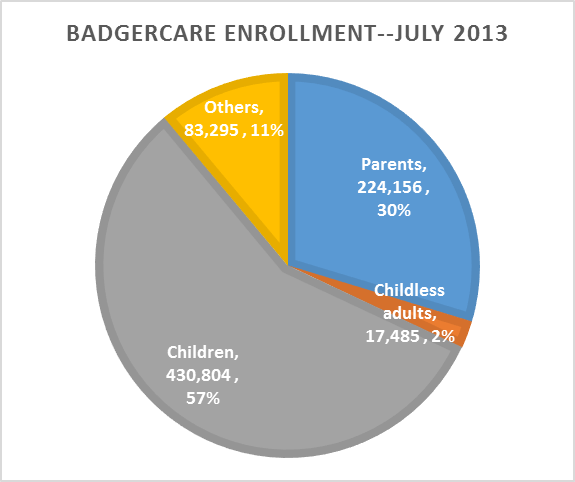 Those leaving Medicaid were mostly parents, while those newly eligible were mostly adults without children, as can be seen by comparing the two pie charts below, the first for July 2013, the second for February of this year. Since eligibility for tax credits to help pay for policies purchased through the exchange started at the federal poverty level, it was assumed that parents and others losing Medicaid insurance would get subsidized health insurance on the federal exchange. The Wisconsin strategy came with certain ironies. One was that Governor Scott Walker ran as a fiscal conservative, intent on holding down taxes. Yet, at a time when the state was cutting local government aids, school aids, and transportation, among other things, he turned down federal funds estimated at $220 million or more per year. A second irony was that the Wisconsin strategy resulted from Republican opposition to the ACA and helped preserve Walker’s viability as a Republican candidate for president. Yet his approach was viable only because of the ACA. Without the ACA there would have been no exchange offering subsidized health insurance to those pushed out of Medicaid. 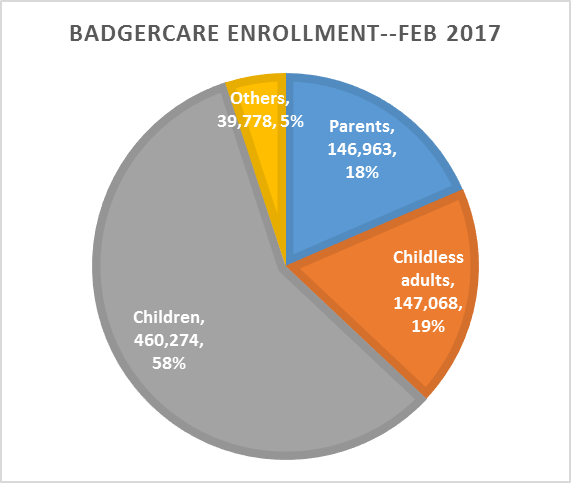 While Wisconsin is generally listed as a non-expansion state, its enrollment numbers put it in company with the expansion states. It fits more comfortably on the trend line for the expansion state than for those not expanding Medicaid. Wisconsin’s unenrolled rate dropped about as much as the average expansion state (47 percent for Wisconsin versus 48 percent for the average expansion state). Despite Wisconsin acting like an expansion state when it comes to driving down the number of people without insurance, this decision has several costs. I examine in next week’s article why Wisconsin would be better off if it officially joined the other expansion states. This would be the dumbest thing ever, as the Feds are going to drop down their part of the bill. States will see their roads and schools go to hell to pay for this. Our roads and schools have already been devastated by the walker regime, so what is your point? WCD, so to avoid a potential cut tomorrow… we should take less money today? That’s like saying you don’t want a raise at work because if there’s a recession, you could be laid off.